What is going on with the design and construction industry? It’s time to start talking the same language! 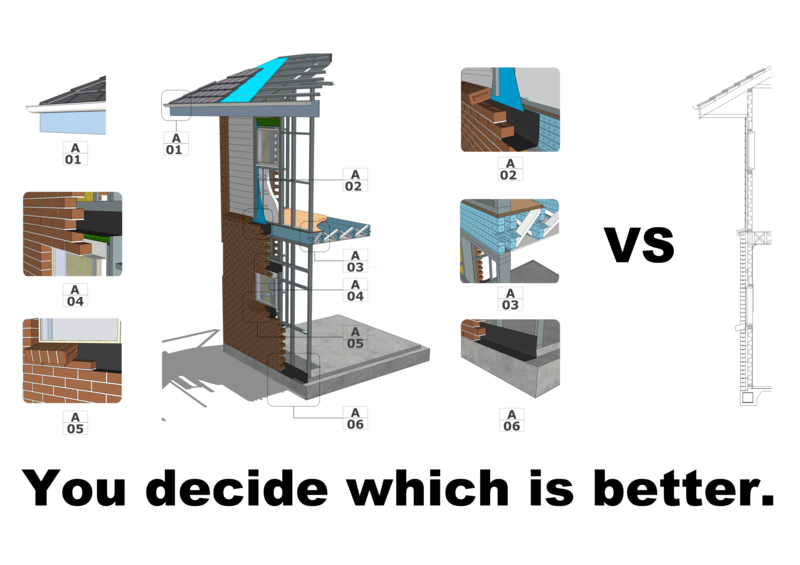 Residential design and construction are two ‘peas in a pod’, yet the communication between them is rudimentary at best. Coordinating a project that runs on time and on budget is a rare occurrence. But where does the breakdown occur? In a perfect world the 6 main stakeholders would have a clear understanding of what is involved in each aspect of a project, and be aware of exactly what needs to be communicated. They should understand the client’s needs and expectations, the design intent, the constructability of the design, the cost associated with the design, the products that are required to enable the successful construction of the design, the regulatory conditions on the land, as well as the costs associated with putting all of the pieces together, within a reasonable time frame. We all know we don’t live in a perfect world, but improving communication across the 6 main stakeholders is the key to better design, better planning, waste reduction, cost reduction, time reduction, and better built outcomes. Communication breakdown is perhaps the leading cause of all Project failures. We NEED to improve the way that Design Professionals, Consultants and the Construction Industry communicate and coordinate with each other. To put it simply, the most important ingredient of a successful project is communication. The Architect: The architect needs to understand the client’s requirements, and then clearly convey the design intent to the client. Subsequently, they must communicate the design along with the constructability aspects of the project in a clear and concise way, by producing detailed drawings, such as: plans, elevations, sections, and details. The Consultants: Consultants, such as Structural Engineers, need to decipher the architect’s intent and determine what structural elements need to be associated and calculated according to the relevant authorities, standards, and building codes. Manufacturers/Suppliers: Manufacturers need to ensure that the Architect, Client and Builder/Contractor all understand their products, so that they are used in the correct manner. Regulatory Authorities: Regulatory Authorities need to decipher the architect’s intent and understand how the project will fit into the landscape and how the design will impact the environment and neighbouring properties. The Builder/Contractor: Builders/Contractors have to decipher the architect’s and client’s intent, and translate these drawings into the built form, on time and on budget. The problem resides in the fact that a majority of projects are no longer simple. Complexity and architectural expression is a good thing, yet the communication of these designs can quickly become cumbersome. Even small residential projects can blow out to A1 paper format and/or have 15 or more sheets to sift through. It is easy for the builder to miss details or annotations if the plans are not studied thoroughly, or executed in a concise and easily understood manner. Believe me when I tell you that twenty (20) A1 plans are difficult to quote from. If the builder/contractor misses one detail, this oversight has the potential to drastically impact the builder’s profits, or even make the job completely unprofitable. This kind of error, as well as inadequately explained elements of the design, forces the budget to be blown out further, with the builder having to recoup costs by charging the client for over-inflated extras. Many would simply say that the builder should study the plans properly. However, we all make mistakes, no matter how diligent, or how much experience we may have. Moreover, Builders/Contractors do not typically charge for a quote. Imagine spending 40 to 80 hours going through a large 2D documentation set and compiling quantities, liaising with subcontractors and putting a quote together – and at completion, all that they have to show for all of this work is a couple of pages with a dollar figure on the last page. Understandably the first thing the client wants to see is the dollar figure. They have no concept of the time involved to quote, and will happily send the plans out to ten builders. This equates to approximately 400 – 800 hours of unpaid work! Unpaid work is not good practice for anyone in any business, and it is evident that this part of the system is broken and in a big way. 2D plans are fast becoming antiquated. They are cumbersome, they get damaged, and they are not easily interpreted. If you give a comprehensive set of plans to multiple highly skilled and experienced Builders/Contractors, you will inevitably get a different built interpretation from each Builder/Contractor. Why? Because 2D plans require deciphering and interpretation. Cross referencing a large set of plans is ludicrous. And don’t get me started on the notion of viewing 2D PDF plans on a screen, as this is actually worse! Have you ever tried to take in every aspect of a building, or search for design errors from an A1 plan on a computer screen? I have, and it simply is not possible to do it correctly or efficiently. Furthermore, not only is it difficult for a Builder/Contractor to accurately decipher 2D plans, but it actually costs Architects ludicrous amounts of time and money to create acceptable 2D plans. The process is a tedious waste of resources and efficiency, and a single page alone usually goes through dozens of iterations and countless hours before the line-weights and readability are adequate. On top of this, the simple truth is that the majority of clients do not understand 2D drawings. 3D models need to be utilized to a fuller extent: less 2D and better 3D. In saying this, there is a lot to be done to change accepted standards, and governmental policies. However, there is no time like the present. I recently met with a local politician to demonstrate the benefits of 3D software, and he enthusiastically espoused the advantages that 3D models would offer the government/regulatory authorities, before I even had a the chance to open my laptop. 3D is the key to better communication. I am not talking about the 3D PDF’s, as they are cumbersome, and simply do not have the resolution, or the ability to interact and change from finished view to structural view (which is where the majority of mistakes happen). Changing from 2D view to 3D perspective, in colour, with textures, is the pinnacle of communication. Associating information with the textures and the components is paramount. Adding 3D models into a 3D plan allows visual interpretation, clash detection and clear communication. I scratch my head every time I see a set of 2D drawings, even though I have over 24 years within the Construction Industry. Honestly, 2D plans are the bane of my existence. Why do Architects spend so long in the 3D model, but present in 2D? The advantages of a 3D model are immense, as the client has a far greater understanding of 3D CAD drawings over 2D CAD drawings. I could not tell you how many times I have heard the client say ‘If I only knew that was the way it was going to look before we started construction’. As iterated above, 2D drawings require each individual to interpret them in their own way. 3D models also allow for better collaboration with Manufacturers. Imagine if Architects were able to design with real products from real manufacturers, and Builders/Contractors could send out purchase orders directly from the 3D model? Even though we already have this 3D technology, it is being grossly underutilized. Because of this, I started asking the following question to my architect and designer friends: ‘Why don’t you deliver plans in 3D format?’ To my dismay, the following answers were espoused time, and time again: ‘It has to be in 2D’, and ‘You can’t deliver a project purely in 3D; it is not doable or possible yet’. Design Professionals and the Construction Industry NEED to understand that it CAN 100% be done, and that it is easy to do. 2D plans are useless in comparison to a 3D model, which has all associated information, details, and 2D orthogonal on-screen plan generation capabilities. If 2D plans were softer, I could think of a far better use for them (if you get my drift)! I recently conducted an experiment on a mildly detailed job, where I refused to provide my trades with 2D plans. I gave them a low-end computer, a BIM/VDC 3D model and a bill of quantities. And it worked better than I could have ever imagined! The feedback from the foreman was that they were very happy without the 2D plans, but the lack of paper meant that they had nothing to scribble on, or do calculations. This summary essentially reduced 2D plans from being a comprehensive document, to a mere source of on-site paper that they could doodle on. How was the execution of the job you ask? The interpretation of the plans was brilliant, the execution of the job was above average, and the profit margin was 10% greater than estimated. Furthermore, the wastage on the job was almost nil (we had 25 bricks left over). How would less 2D and more 3D impact the Industry? Maximisation of 3D Virtual Design and Construction models would dramatically increase the speed of design and project deliverables, increase profits, and reduce error, for all stakeholders involved within a project. Why? A shared, comprehensive 3D model facilitates better understanding among all of the main stakeholders, and completely eliminates any deciphering/interpretation of a project. Comprehensive 3D communication, in place of antiquated 2D, is the way of the future. Architects are not from Mars, Builders/Contractors are not from Venus, Engineers are not from Saturn, Authorities are not from Jupiter, Manufacturers don’t distribute from Pluto, and Clients do not come from Uranus. We are all from the same planet, people. We have the capacity to communicate better.. And, the technology already exists! If you want to know more about the technology to which I refer, see HERE. If you already have the software, and would like to be trained in how to maximise your 3D output, whilst minimising your 2D output, please see HERE.